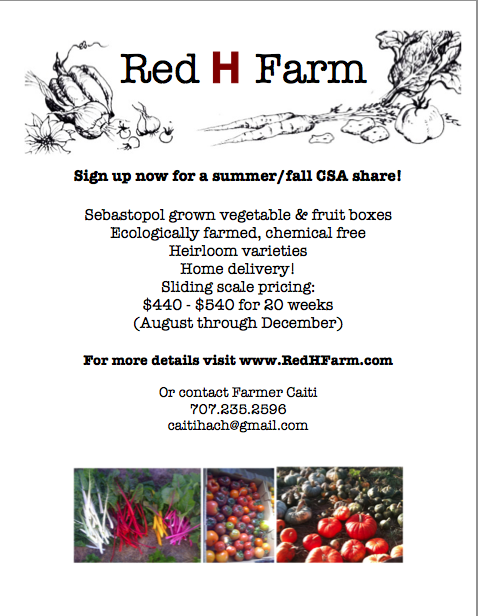 ← 2013 summer CSA shares are available! CSA shares for the Late Summer – Winter 2013 delivery season are now available! Having moved back to the west coast and resumed farming in May, the last month and a half have been busy! After 6 weeks of serious work crops are looking strong, fields are looking lush and the bounty is just around the corner. Stretching cucumber plants begin their slow creep beyond the borders of their beds to block walkways. Thick walls of tomatoes create microclimates for the green onions and basil planted at their base. Hedges of beets beg to be thinned, thriving in the shade of steadily growing sunflowers. Greens, benefiting from the bug repelling characteristics of companion-planted marigolds, create a thick canopy for crouching frogs. And the greenhouse remains packed. The fields are slowly filling with crops and the future looks promising. So hurry up! Shares are moving fast and we’d love to have you join the family at Red H Farm. Check out the CSA page for more details, and take a peek at the flier below for a glimpse of what’s up. Send an email to caitihach@gmail.com to confirm that your delivery location is on the route and you’ll be on your way! Serious catch up on 2013 Newsletters! email: caitihach@gmail.com phone: 707.235.2596 ...or come find us at the farmers market!